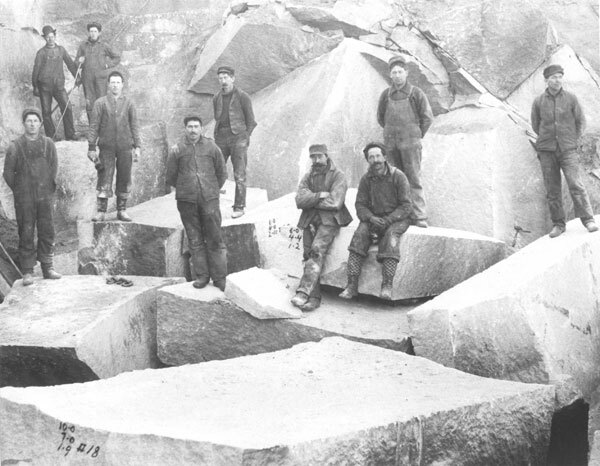 Granite Quarry and workers, Consolidated Granite Co., Eagan Quarry, Barre, Vermont, date unknown, photographer unknown.. In the first decades of the twentieth century, several thousand Spaniards –predominantly from the northern region of Cantabria– emigrated to Vermont, where they worked in the granite quarries of Barre and Montpelier. During these same years, if not earlier, there were also Cantabrian quarry workers in the state of Maine (Hallowell) as well as in the town of Quincy, Massachussetts, just south of Boston. En las primeras décadas del siglo veinte, varios miles de españoles –cántabros, la gran mayoría– emigraron al estado de Vermont, para trabajar en las canteras de granito de las ciudades Barre y Montpelier. En la misma época, si no antes, también había canteros cántabros en el estado de Maine (Hallowell) y en Quincy, Massachussetts, al sur de Boston. Mary Tomasi. “Barre’s El Club Español.” American Life Histories: Manuscripts from the Federal Writers Project, 1936-40. Mary Tomasi. “Ex-Stone Cutter and His Wife–Spanish.” American Life Histories: Manuscripts from the Federal Writers Project, 1936-40. “El Club Español de Barre, Vermont.” La Prensa (NY), March 15, 1917.